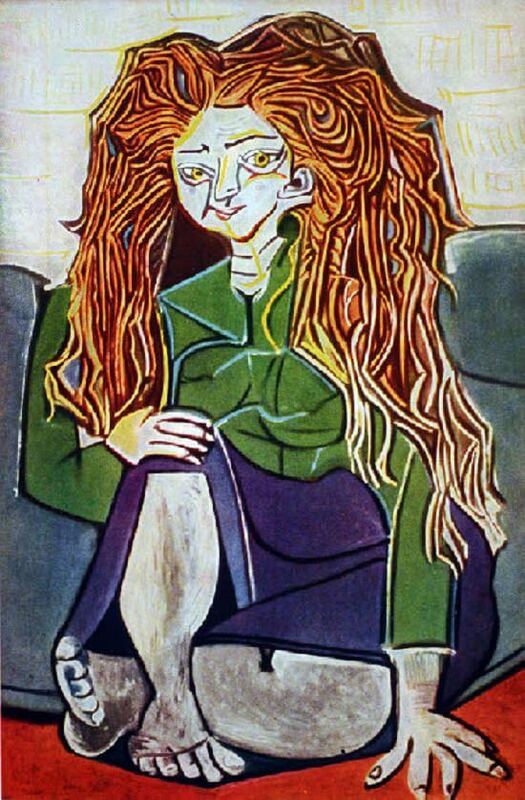 Picasso's support for Communism was at its strongest in the decode after the Second World War, although he remained a lifelong member of the Party. During this time many of Picasso's closest friends were also strand supporters of Communism amongst whom were the art critic and writer Helene Pormelin (19 15-98) and husband, the painter Edouard Pignon (1905-93), Both were active in Communist cultural circles, and regularly spent the summer months with Picasso in the south of France. Pormelin had expressly shown her distain for America's involvement in Korea in one of her novels. She also wrote two articles in praise of Picasso's War and Peace m and several books recounting the time she spent with Picasso. This portrait shows Pormelin seated on the floor, as, engrossed in one of the intense political conversations that often took place between Picasso and the writer. Her wild red hair cascades over her shoulders uncontrollably, which, together with her engaged but ungainly posture, suggest a spirited and passionate individual.